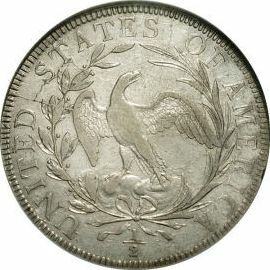 The Draped Bust Half Dollar with Small Eagle reverse was produced between 1796 and 1797. This coin had a combined mintage of only 3,918 pieces for both years. This fact makes demand for them very high by collectors and investors alike. union. 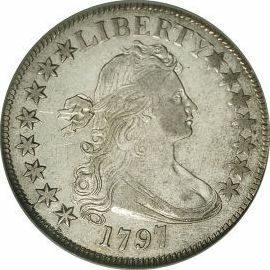 The obverse also has LIBERTY inscribed above and the date below the portrait. The reverse has a small eagle perched on a cloud surrounded by a wreath of olive and palm branches. It also has the inscription UNITED STATES OF AMERICA around the wreath. Another way you can identify this particular series of half dollar is that it has the denomination symbol 1/2 on its reverse.